MTS (Metropolitan Transit System)- Buses, trolleys and coasters provide convenient transportation throughout San Diego County. 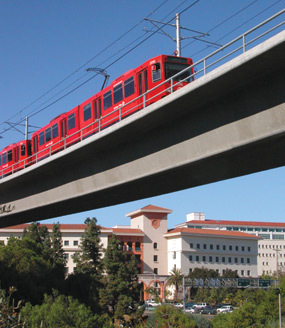 The San Diego Trolley runs every 15 minutes throughout most of the day and in intervals of 30 minutes in the evening. The North County Coaster runs 43 miles along the coast with station stops in downtown San Diego, Old Town, Solana Beach, Encinitas, Carlsbad and Oceanside. All MTS buses, trolleys and coasters are equipped with wheelchair lifts. For schedule and fare information contact the Metropolitan Transit System at (800) COMMUTE or visit their website at www.sdcommute.com. Zimride is SDSU's social network for ridesharing. Split the costs by driving fellow SDSU community members and protect the environment. Membership is free. All SDSU staff, faculty and students with a campus email address are eligible to sign-up for our private Zimride Rideshare Community. You save money, protect the environment and help us build a new form of sustainable transportation. Zipcar - Zipcar is available by the hour or the day. 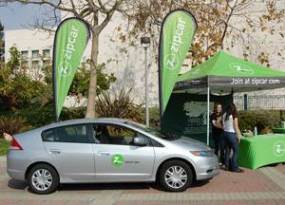 There is access 24 hours a day, 7 days at week, to Zipcars parked right on campus! Simply reserve online, let yourself in with your Zipcard and drive. iCommute is a program is free to all students, and you do not need to own a car to participate. You will be matched with other students who live near you, according to your class schedule.